Michelle Miller was presented with the Marianne Campbell Volunteer of the Year Award, presented by Marianne Campbell and Jenni Dovyak-Lewis. 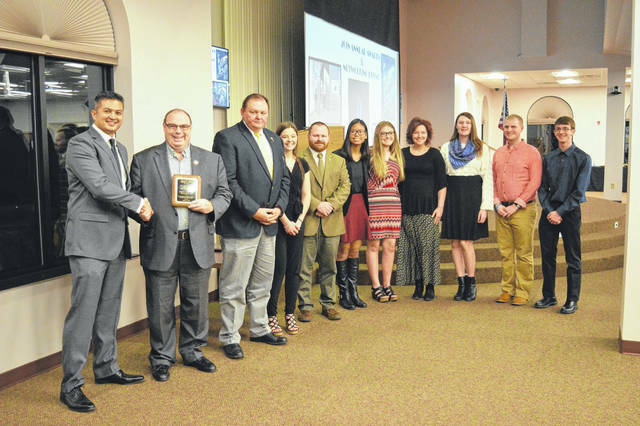 The 2018 Ray McKinnis Committee of the Year Award went to the South Gallia Leo Club, River Valley Leo Club and Gallipolis Community Leo Club (based at Gallia Academy). From left to right are Anthony Sola, Leo Clubs Regional Advisor Chris Homer, South Gallia Leo Club Advisor Jeff Fowler, South Gallia Leo Secretary Maria Calhoun, South Gallia Principal Bray Shamblin, Gallipolis Community Leo Club Vice President Sydney Crothers, River Valley Liaison Jayla Sargent, River Valley Advisor Chloe Houk, Gallipolis Community Leo Club Treasurer Elizabeth Hoover, Gallipolis Community Leo Club President Derek Henry, Gallipolis Community Leo Club Secretary Nicholas Sheets. Gallipolis Community Leo Club Advisor Sandra Mayes, not pictured. 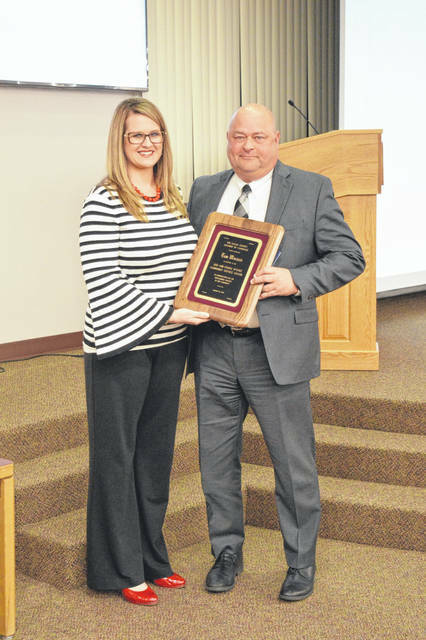 Past Gallia Chamber of Commerce Board President Meagan Barnes presents Ohio Valley Bank’s Tom Wiseman with the Bud and Donna McGhee Award. Twisted Vine took home the 2018 Beautification Award. 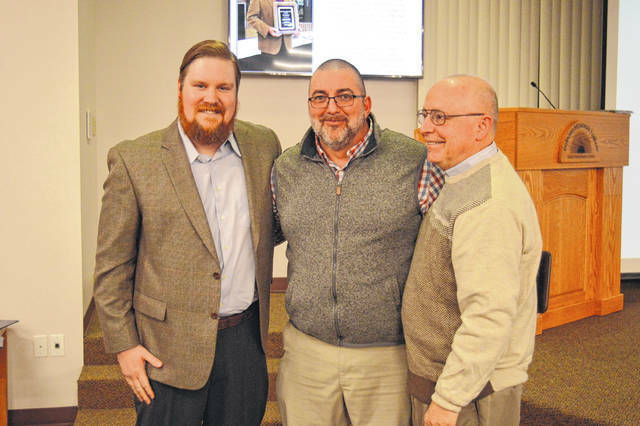 Jessie Collins and Bill Davis received the award from the Wiseman Agency’s Rick Jackson. Josh Bodimer presented Autumn Thomas with the 2018 Community Involvement Award for Thomas Do-It Center. 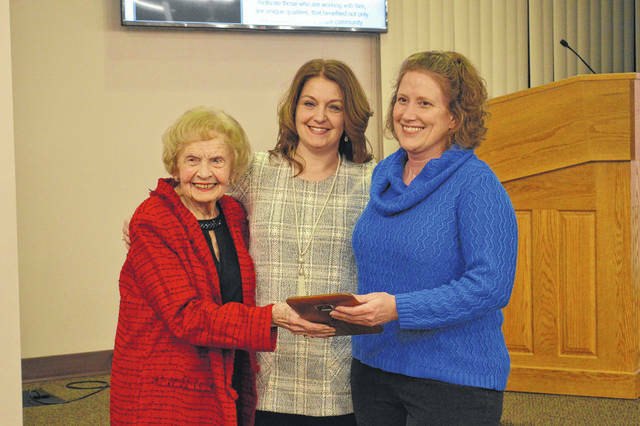 GALLIPOLIS — The Gallia County Chamber of Commerce once again recognized some of the most dedicated and involved community members and organizations during its 82nd annual Awards Ceremony, Thursday evening. The Twisted Vine Family Vineyard received the Chamber’s 2018 Beautification Award. According to the Chamber, what began as a gesture of love with the planting of a few grapevines, has led to a family vineyard built upon four generations of land stewardship. Formerly, a horse pasture and hay field, the Davis and Collins family began the vineyard in 2009. Construction of the winery began in 2015, with the business officially opening in May 2018. The Thomas Do-It Center received the Chamber’s 2018 Community Involvement Award. According to the Chamber, in 2018, Thomas Do-It Center donated materials and construction for the completion of the new Gallia County Fairgrounds 64 stall, horse barn. They participated in Small Business Saturday with a free gift card distribution and made donations to the Chamber, Gallia Soil and Water Conservation District, the River Museum, and is a long-time supporter of the Gallia County Livestock sale, and much more. Their generosity totaled more than $200,000 for 2018. With the purpose of enriching the lives of not only its student members, but also the community the Gallipolis Lions Club initiated the Leo Clubs. In 2018, the three clubs logged over 600 combined community service hours. Compromised of South Gallia, River Valley and Gallipolis Community (Gallia Academy) Leo Clubs, they received the 2018 Ray McKinniss Committee of the Year Award. Former Chamber Executive Director Michelle Miller was recognized with the 2018 Marianne Campbell Volunteer of the Year Award. 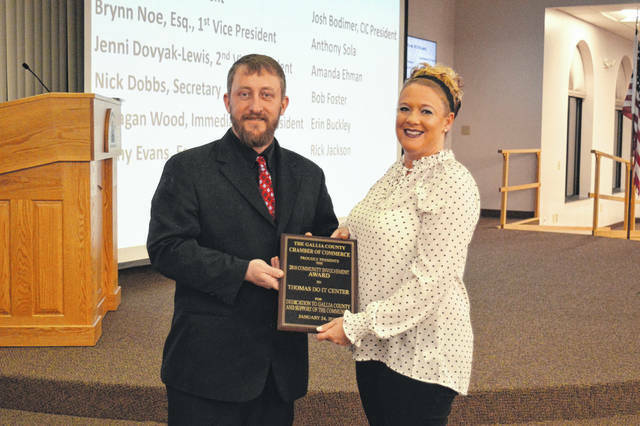 In addition to serving the Chamber for over four years, her commitment to the Chamber after her service, by immediately volunteering for the River Recreation Festival Committee and other Chamber needs, has been invaluable, Chamber officials say. Always ready to help, she continues to be a resource of information and is always willing to serve, when needed. With the intent and desire to expand floor space and retail, Bridgeport purchased the former K-Mart location and transformed a closed department store into a hunter’s, farmer’s, and fisherman’s dream. The business received the 2018 Sudden Impact Award. Since 2013, Skyline Bowling Center has flourished with family fun, Chamber officials say. With the addition of bumper cars and an arcade in 2013 and mini golf and batting cages in April 2017, Skyline has become a center for local entertainment. In 2017, Skyline took it a step further, including youth in organized fun by creating high school and college leagues with our local schools and university. The business was recognized with the 2018 Small Business of the Year Award. Information was provided by the Gallia Chamber of Commerce.